When I visit home, my dad often complains about the news: most specifically, the overuse of the phrase “BREAKING.” When he was a kid, he laments, “breaking news” suggested a national emergency like the Kennedy Assassination, where now it seems to be applied to any old political gossip. 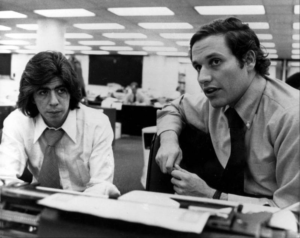 Carl Bernstein (left) and Bob Woodward pictured shortly after uncovering the Watergate Scandal. Photo courtesy of dailyherald.com. Most American high schoolers learn about Bob Woodward and Carl Bernstein and their famous uncovering of the Watergate Scandal as a high point of American political drama, but in an era with more media coverage than ever it can feel like this hard-knock, investigative journalism has faded; in fact, for many people “the media” is a dirty word, tossed around when one is talking about dangers of technology. Amidst the sea of political changes in recent months, the integrity of the press has come under attack, especially by the current administration. Trump has (quite iconically and repeatedly) called the press “fake news,” tweeting statements like, “‘Fakers’ at CNN, NBC, ABC & CBS have done so much dishonest reporting that they should only be allowed to get awards for fiction!” The tension between the government and the media has worried many scholars and politicians, who fear that Trump’s comments about the media imply a more insidious, autocratic desire to control free speech. Some even wonder if we have entered a “post-truth era,” where leaders are no longer bound to accountability and honesty. While all this drama makes for entertaining television, it can also make us feel helpless about the future of news and media in general. 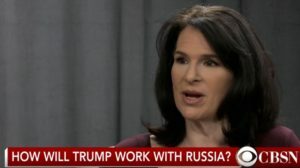 Fordham Professor Beth Knobel on CBS discussing President Trump’s Russia strategy. Photo courtesy of bethknobel.com. But, according to award-winning journalist and Fordham professor Beth Knobel, there is hope. 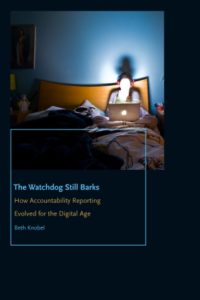 In her book The Watchdog Still Barks, she challenges the idea that watchdog journalism is ineffective or nonexistent. For Knobel, who has spent most of her career as a reporter and producer on Russian events, most notably as the Moscow Bureau Chief for CBS News, contemporary questions about technology and free speech are a perfect backdrop to study how news outlets have exercised their watchdog abilities in a shifting and sometimes turbulent political landscape. Based on the first content analysis to focus specifically on accountability journalism nationally, The Watchdog Still Barks examines the front pages of nine newspapers located across the United States to paint a broad portrait of how public service journalism has changed since 1991 as the advent of the Internet transformed journalism. This portrait of the modern newspaper industry shows how papers of varying sizes and ownership structures around the country marshaled resources for accountability reporting despite significant financial and technological challenges. The Watchdog Still Barks includes original interviews with editors who explain why they are staking their papers’ futures on the one thing that American newspapers still do better than any other segment of the media: watchdog and investigative reporting. Although we may grow frustrated with the constant surge of “breaking news,” Knobel’s groundbreaking study is a reminder to remain optimistic about the future of reporting, even amidst the noise of modern life. For those who can see beyond catchy headlines, this flurry of media activity is a symbol of the vitality of watchdog journalism, even when it seems to be threatened.